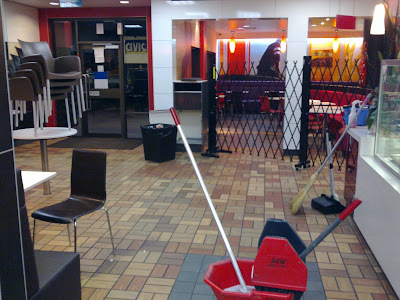 Perth Hacks - best tips, hints and bargains: 24hr McDonalds dining room.... or is it? This is what happened when we went to the local Melville McDonalds store in Perth just after 12am. This area photographed is the main restaurant dining area which is supposed to be open 24 hours. There were only 4 tables available so we were practically sitting next to another group.